I always like to try and talk to my son about what he has done at school that day. His normal response is “things and stuff”, unless something very specific has happened. It is something that many parents ask on the way home with varying amounts of success. 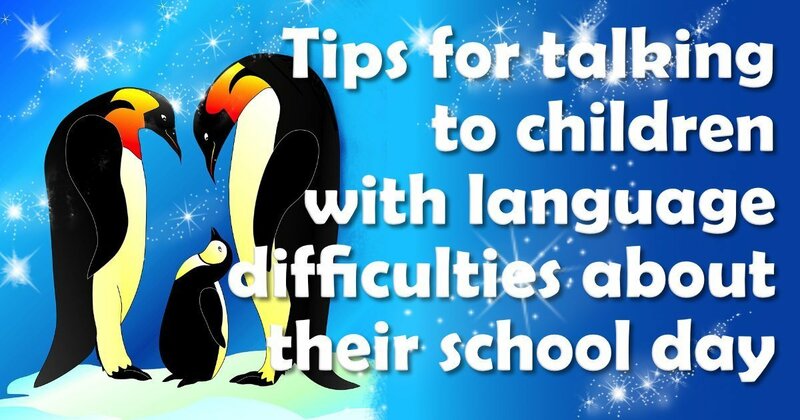 If your child has a language or communication difficulty it can makes these questions even harder. We saw some lovely posts about different ways to ask this question e.g. What was the silliest thing someone said? Or did you see anyone picking their nose? I personally love “Tell me one helpful thing you did today”. These questions are designed to spark a conversation, however depending on your child’s language levels these may well be rather tricky. So we thought we would write a differentiated version! These ideas start for children with little or no verbal language and extend on to children using full sentences. Communication books. If your child finds it hard to understand these questions verbally you could try some visual support. Now you may well need some help from your child’s school for these. If you can get pictures of the staff and toys/ activities in school and print them on one sheet of paper, you can use this as a communication board. You can start by asking ‘who’ questions e.g. “Who did you see?”, “Who did you play with?”. Encourage your child to point at the pictures. If they find this hard you can point at a picture and ask “Did you see Mrs. Smith?”. Then you could try some simple what questions. Visual support. I also find the above idea of a communication board, really useful for children with memory difficulties or unclear speech. The pictures can act as a prompt or reminder to help the conversation. So rather than pointing at the pictures, your child might look at the pictures first before you start talking about school. This can also work really well in reverse if you send in pictures from home. Then your child can talk to a member of staff about what they did at the weekend/ on holiday etc. Before questions. Many children find answering questions really tricky. Instead, before your child goes into school in the morning, talk to them about what they might do and ask them to try and remember one thing to tell you at the end of the day. You may need to keep doing this for a while before they get the idea, but it is a great lower demand activity. Choices. When you start asking questions about their day, you can give a choice of answers. So rather than asking what they did you could ask “Which was better today – maths or English?” (or numeracy/ literacy depending on what your school call them). This makes it easier for your child to give an answer. Easier questions. Rather than asking open ended questions such as “What did you do?” Try asking closed questions such as “Did you play inside or outside?” “Did you do any maths today?” In this way you can start a conversation and you aren’t putting as much language demand on your child. One tip I picked up from a great teacher I used to work with was asking silly questions if your child isn’t really willing to talk. For example, I often ask “Did you ride an elephant?” or “Did you throw snowballs?” (as long as it hasn’t been snowing!) These silly suggestions can often get a conversation started. Expanding language. If you have an older child and you are trying to stretch and expand their language and description skills, you can ask harder questions. I love the ones from the list such as “Which teacher would survive a zombie apocalypse?” Please be careful – you know your child best and if this question would be appropriate or not. But I know quite a few older boys that would love to discuss this and would have some great ideas! Another interesting one is “If you could be teacher for a day, what would you do?” These questions are great as they are about school, but not directly about what happened that day. The first time you introduce this level of question you are likely to have to give examples to your child until they understand. You could use them more as a discussion point at first. You could talk about them as a family and each have a turn adding ideas. This is a great way to show your child how to answer the question as they can hear other answers first. With a few simple changes to the way you ask about your child’s day, you can hopefully find out a little more about what they have been doing. Give it a try! Elizabeth is a speech therapist working in the South-East of England and a regular columnist for Special Needs Jungle as well as one half of the SpeechBlogUK ladies. Ofsted/CQC SEND Inspections and Parents: More Than A Feeling?